An especially comfortable 'medium room' at Dean Street Townhouse, London. Nestled between London’s old world pubs and cosy noodle bars, this welcoming boutique hotel is a haven in busy Soho, writes Rachel Smith. Sometimes all you want is sleek and anonymous. Crisp lines, ironed pillowcases, minimalist décor, a check in so speedy you barely have to utter a word. Other times, only a four-poster bed and a homey vibe will do. Oh, who am I kidding? Nothing beats a four-poster. After pre-travel hotel research that bordered on the obsessive, I already knew the Dean Street Townhouse was something special. But London turned on the charm the day we checked in. A black cab delivered us to the door. It was snowing. Not a speck was out of place on the historic, four-storey Georgian façade, which reminded me of a buttoned-up old gentleman whose past he might deign to share with you over a whisky. If these walls could talk, I wonder what they would tell me of the aristocratic families who made their homes here throughout the 18th century? Or the famous punters who frequented the top floor Gargoyle Club from the 1920s to the 1950s – sources say they included Fred Astaire, Francis Bacon and Lucian Freud. Today, the establishment – a venture under the Soho House private members’ clubs – is one of the area’s best boutique hotels, not least because of its central location. Shoppers are 10 minutes from Oxford Street; night-owls mere seconds from Soho’s thriving nightlife; tourists can meander through winding lanes to find Piccadilly and Covent Garden without a bother. Apart from a lone smoker huddling under the heater on the hotel’s slim terrace, it’s all quiet when we alight from the cab (snow is apparently an excuse to find a pub, my husband tells me), but the heavy glass door swings open and the skinny bellhop, smiling and picking up our luggage like it weighs about half as much as it does, welcomes us in. The lobby is warm, with velvet Chesterfield sofas and a wall of old-school keys behind the desk. Art by Tracey Emin and Peter Blake adorns some walls; apparently there are over 60 works of British art found throughout the hotel. But before we have time to look, we’re handed one of the aforementioned old-school keys and directed to the lift. It’s the first lift I’ve seen with floorboards, but then this place is clearly all about the little touches. 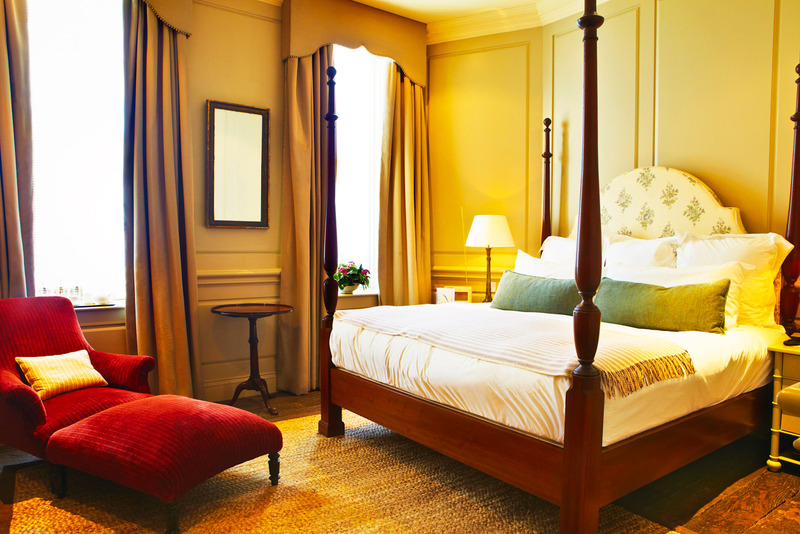 I like the beds: high four-posters that cocoon you in a crush of soft pillows and bespoke Egyptian cotton linen. There’s the hand-painted Georgian-style wallpaper, and the upholstered vintage chairs and sofas; a Roberts radio by the bed and knobbly carpet that’s ever so lovely underfoot. It’s the same in every room, but sizes vary from tiny (affectionately dubbed ‘The Broom Cupboard’) to small, medium and large (the last two are a decent size). Our medium room, on the second floor, is flooded with light and features an antique-style bathtub beneath the wall of windows. I have visions of myself as a 19th-century society lady swanning about in my stays and pantaloons while drawing a bath and sipping a glass of bubbles. There’s a tray with a teapot, mugs and a silver biscuit tin, replenished daily with homemade cookies. A drawer reveals a GHD. And I find a ‘survival kit’ in the small but functional bathroom, packed with mini Cowshed products and white linen drawstring bags stamped with the name of the items inside (razor, condoms, toothbrush, tampons). That I can take this little kit when I leave and reuse it for future trips makes me want to weep happy tears. It’s not often I find a hotel that apparently has thought of everything. My gripes? Any place fashioned out of an old building has its flaws and the dimly lit hallway outside the bedrooms is a squeeze with luggage. The downstairs sitting room is dark and always empty, and some of the décor needs sprucing up. But so charmed am I with the rest of it, it’s easy to overlook the bad bits. We dine that night at the bar and restaurant downstairs. It’s all chandeliers, black and white tiles, wood panelling and a menu of comfort food favourites (roast chicken, pea and ham soup, steak’n’frites) that can be noshed at the bar or on one of the cosy red banquettes. While tempted, we don’t have time to visit The Groucho Club across the street, but we do explore many of the pubs, shops and eateries around Soho. More than once we perch on rustic stools at Shoryu Ramen on Denman Street, where a bowl of rich ramen is so warm and comforting it almost feels medicinal. On our last night, Gopal’s of Soho on Bateman Street serves up the kind of curries my husband craves (and can’t get) in Australia. We’re sad to leave the Townhouse, but we’re back just weeks later for a last minute stay the night before we’re due to fly home. The fact that we’re remembered and upgraded when we check in late and exhausted is a nice touch – as is the full biscuit tin and the deep bathtub that awaits. I can’t think why anyone would choose sleek and anonymous over this. Closing the door on Soho’s buzz is easy at this hip little hotel. It’s everything you hope to find in a big city. Rachel paid $411 for a medium room.